A Mouse Clicking Macro Software to do Mouse Clicking on Windows Computer is presented here. The Macro Software can do programmed Mouse Clicking for you with configurable speed. Without learning Programming, you can create your first macro within minutes and get a taste of Windows Automation where the Macro Software performs repetitive tasks for you. 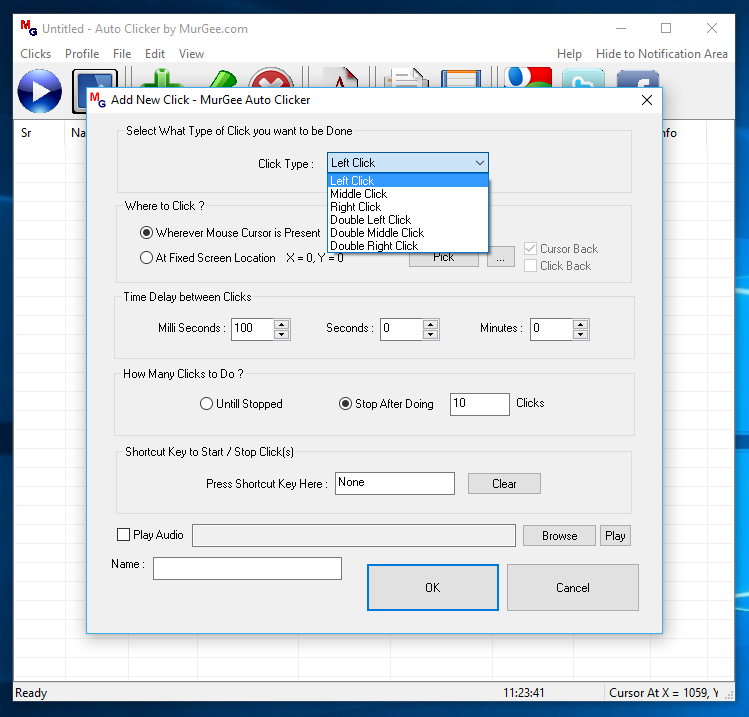 You can create a Macro by adding Mouse Clicks to be simulated at specific locations or you can simply use Mouse Click Recorder to Record Mouse Clicks and then play them back effectively let the software do Mouse Clicking for you. 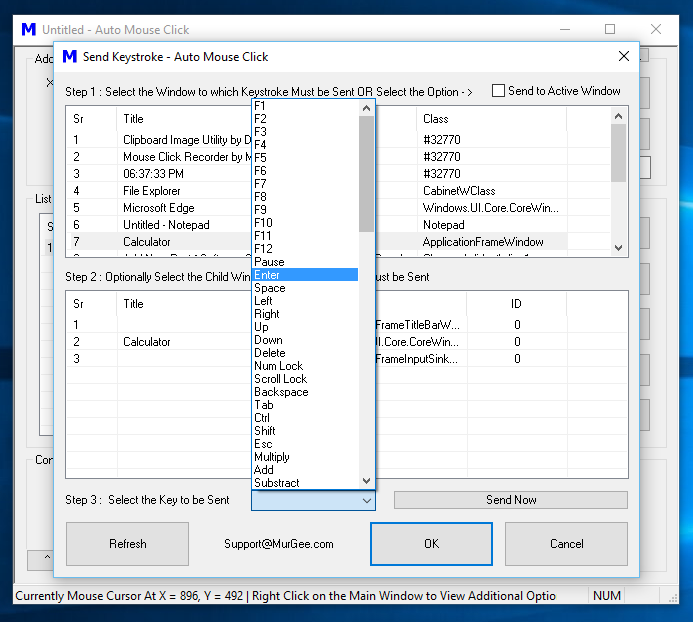 The above Screenshot displays the Mouse Click Macro Software running on Windows 10 which has a Script loaded to do Left, Middle and Right Mouse Clicks. The Macro whenever run or executed automates Mouse Clicking at specific / pre-programmed screen locations. 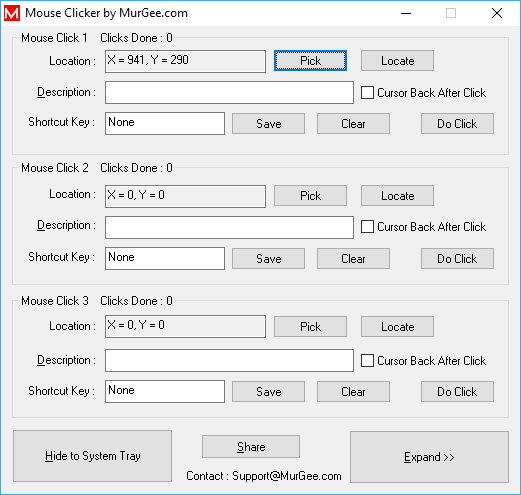 You can download and try out this Auto Mouse Click Software Application to create a Mouse Clicking Macro and speed up / repeat your Mouse Clicking tasks. This Mouse Automation Software works well on Windows 10, Windows 8.1, Windows 8, Windows 7, Windows Vista and other Windows versions like Windows 2000, Windows Server, etc. When you want to Click at large number of Screen Locations, you can use Macro Recorder as displayed in the Screenshot below to Record and Playback a Mouse Clicking Action from your Macro Script. The above Screenshot displays Macro Recorder which allows you to embed a Macro Recording in any Mouse Click Macro Script. Mouse Movements, Mouse Dragging, Mouse Clicking, and everything you do with Wired or Wireless Mouse is recorded by this Macro Recorder with exact time delays. You can Play the Macro Recorded from the Macro Recorder itself or you can execute the Macro Recording from the Macro Script. Yes you can even Record & Playback Keystrokes with this Macro Recorder by enabling Record Keystroke Checkbox at the bottom of the Macro Recorder. When you want to create an Accurately timed Macro to do Mouse Clicking, you can create a Macro Script and use other User Input Automation Actions in your Macro as displayed in the Screenshot above. By using other User Input Actions, you can create a Sequence of Windows Automation Macro containing Mouse Click, pressing of Keystrokes, Timed Delays, Keystroke Combinations like Ctrl + C, Shift + F10, etc. 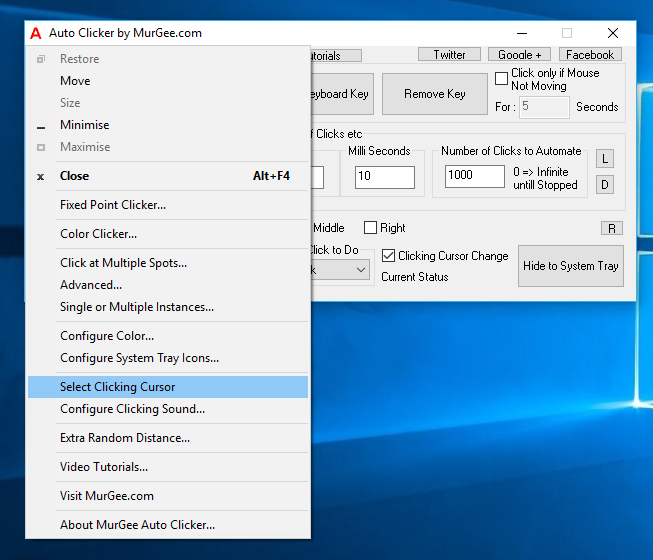 Whether you want to Auto Click at current Mouse Cursor Screen Location, press a single Keyboard Key Multiple Times, or even Automate a repetitive task which requires you to do lots of Mouse Clicking, pressing Keyboard Keys, Switch between Applications or anything else, just create a Macro with this unique Mouse Click Macro Software and let the Software do work for you. Each Macro Action added to the Macro Script can be assigned non-zero Repeat Count which allows you to Repeat an Action from within the Macro. 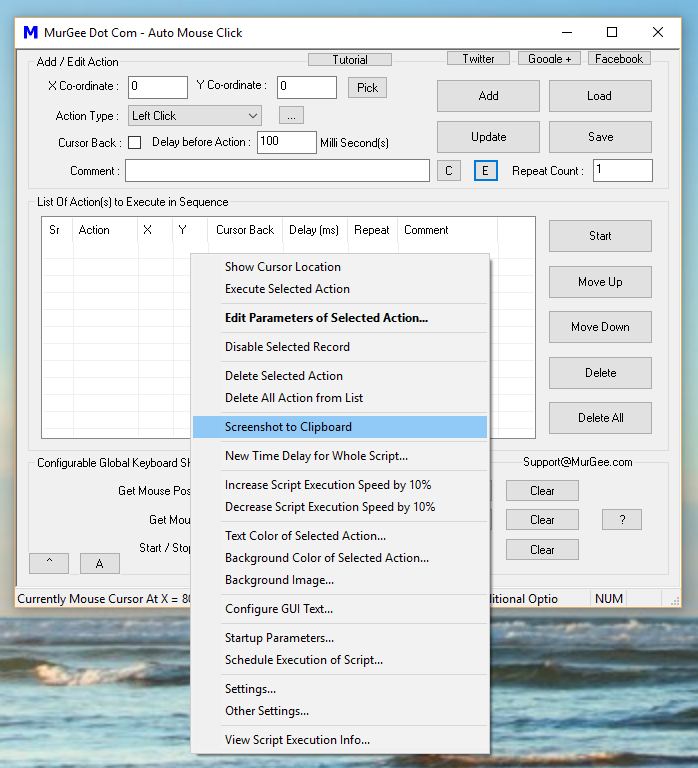 The above Screenshot displays Action Parameter editing Screen in which Left Mouse Click has been configured to be repeated 5 times. The Actions added to the Macro gets executed in sequence and instead of adding multiple Actions to the script, you can simply modify the repeat count of any action so that it is executed specified number of times. The Repeat count parameter of Macro Action, makes your Macro Smaller and easy to configure and control. You can configure this Software to display a different Mouse Cursor when a Macro is being executed so that you can visually monitor and control the Macro Playback. Another way to visually confirm the Macro Execution is by enabling the display of Macro Script Executor which is basically a small Window displaying the logo of the Software. You can also configure the Software to actually Move Mouse Cursor to pre-determined positions instead of setting the Mouse Cursor Position from the Settings window as displayed above. 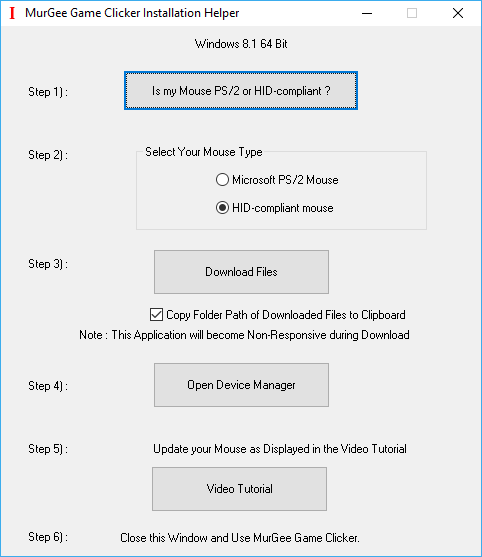 Other configurable settings allow you to control the Window of this Mouse Clicking Application, whether it stays always on top and other parameters. 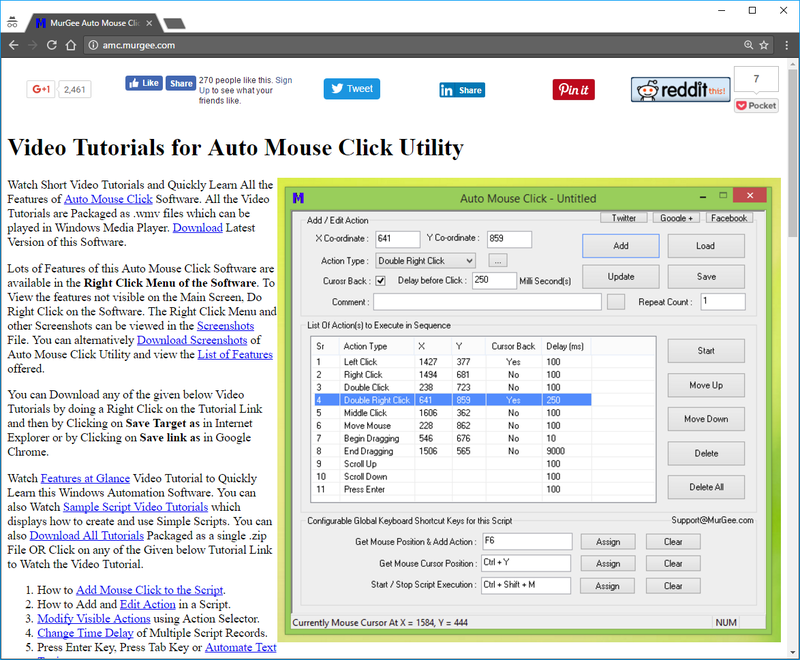 In case you are wondering, How Can i Create a Mouse Click Macro with this Mouse Automation Software, look no further as we have got you covered with Free Video Tutorials to get you Started. Yes you can download this Software for Free and Watch Video Tutorials to learn the art of creating Macro Scripts containing Mouse Clicking and other User Input Actions on your Windows Computer. The Free Trial of the Software is fully functional and there is no functionality limitations so that you can utilize all the features including usage of Macro Recorder to Record and Playback Mouse Actions, inbuilt Macro Editor for easy editing of your Mouse Actions like Left Click, Right Click, Middle Mouse Click and other User Input Actions. Yes you can Save your Macro Scripts and load them later and run the loaded Macro Again and Again to Automate your Repetitive Windows Tasks. Mouse Clicking is the basic way to communicate with any Online or Desktop Game and this post provides a software utility with which you can play your Game with assistance from a Mouse Clicking Software. Whenever playing a Game, you feel that a helping hand should be there to assist you in your Game to do repetitive Mouse Clicking, you can use the Auto Clicker to do repetitive Mouse Clicking as displayed in the screenshot below. As the Mouse Clicking is simulated by the software, whether you are using a normal Mouse or even a Gaming Mouse, this Software Application works just fine. Yes the above presented software application is really easy to use and is really sophisticated application for advanced Mouse Clicking purposes. You can read all about it given below or navigate to the Auto Clicker page to download and try it yourself. This is a try before but Software Application and runs on Windows 10, Windows 8.1, Windows 8, Windows 7, Windows Vista and even on other Microsoft Windows Operating Systems running on 32 bit or 64 bit Architecture. It uses minimal RAM and CPU resources and various parts of the application are bundled as different applications so that when using one feature of the application, you do not need to waste RAM and CPU resources for features which you are not using. At Current Mouse Cursor Location or in other words, the software will click wherever you Move your Mouse Cursor. At Fixed Screen Location so that irrespective of your Mouse Cursor Location, the automated Mouse Clicking is done at a pre-determined Screen Location. When playing a Game or even when using Windows Application and doing Mouse Clicking with physical Mouse buttons, there is a time delay associated. There is time delay between pressing of Mouse Button and then releasing it and there is altogether different Double Mouse Click delay. When we double click with our Mouse, we basically press and release the Mouse Button 4 times. Microsoft Windows does allows us to control the Double-click Speed from Windows Control Panel. 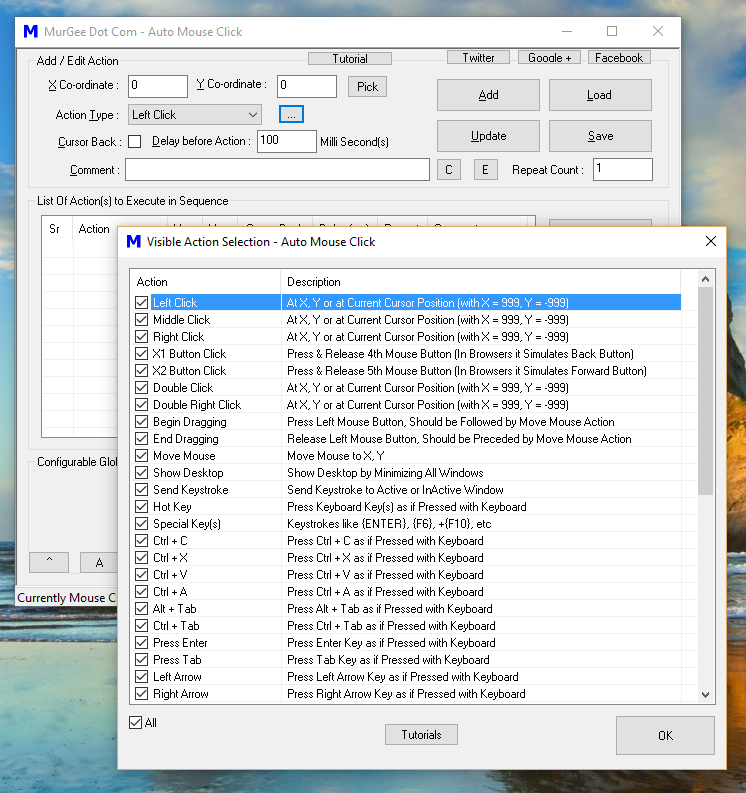 Switching primary and secondary buttons, changing Mouse Pointers, configuring Pointer Speed, enable or disable Mouse Pointer trails and much more is configurable from Mouse Properties applet of Windows Control Panel. Changing Mouse Cursor to a different Mouse Cursor or even an animated Mouse Cursor is one of the most common usages of Mouse Properties Screen. The Auto Clicker also provides configurable settings which allow you to control various aspects of Automated Mouse Clicking. In most cases default settings should be fine enough to go ahead, however if your Game is not recognizing the Automated Mouse Clicks, you might need to tweak the Time Delay between Mouse Down and Mouse Up or even the time delay between 2 Mouse Clicks making together a single Double Mouse Click. Note in the above Screenshot that there is a checkbox for configuring Mouse Shortcut and allows you to configure whether Mouse Shortcut should only start Automated Mouse Clicking or it can also be used to Stop Automated Mouse Clicking. In order to emulate Human Mouse Clicking, you can use the Random Time Delay feature as displayed in the Screenshot above. By default the time delay between consecutive Clicks is configurable from the Main Screen and the Random Time Delay is disabled. Once you have enabled the Random Time Delay in the Auto Clicker, you need to define the random time duration which would be added to the actual time delay. Let’s say you configure Random Time Delay value as 100 Milli Seconds, then for every Automated Mouse Click done by the software, an extra Time Delay of value taken from 0 to 100 Milli Seconds would be added to the actual time delay as configured in the main screen of the software. Games now a days are really complex and Automated Mouse Clicking needs can vary depending on the current Game Scenario / Phase. During Game Play, you might need to click at specific Screen Location at one time and then later in the Game, you might require to Click at Current Mouse Cursor Location. 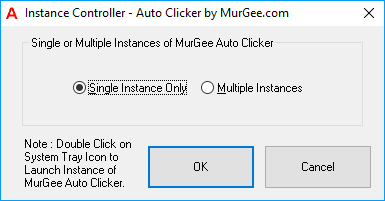 With Instance Controller you can enable Multiple Auto Clickers with different Setting for each Clicker. Once you have enabled Multiple Instances, you can double click on the Desktop Shortcut of the Software to launch another instance and configure it with different Keyboard Shortcut to Click at another Screen Location with different Time delay. Whenever doing Fast Mouse Clicking with fingers, your Mouse Cursor can move a little, whereas when you do Fast Mouse Clicking with the Software Application presented here, the Location of Clicking was either current Mouse Cursor Location or Fixed Screen Location. Now with the Extra Random Distance feature, you can simulate automated Mouse Clicking with Random Distance in either horizontal or vertical direction or even in both directions. Most of the Applications running on Windows do adapt themselves to current Windows Theme automatically, however when you want to distinguish multiple Auto Clickers you can change Color of the Software to easily identify them. 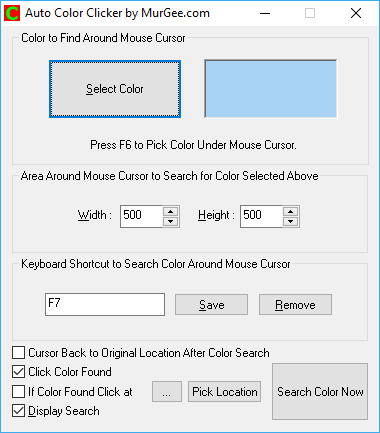 Do have a look at the above Screenshot which displays how you can change the appearance of this Mouse Clicking Application by changing the Background and Text Color. Yes Title bar, Font Style, Appearance of the Software will remain as configured for other Applications using Windows Themes, however a distinct Foreground and Background Color of the Graphical User Interface will definitely help you to distinguish between multiple instances of the Auto Clicker running with individual icons in Notification Area. 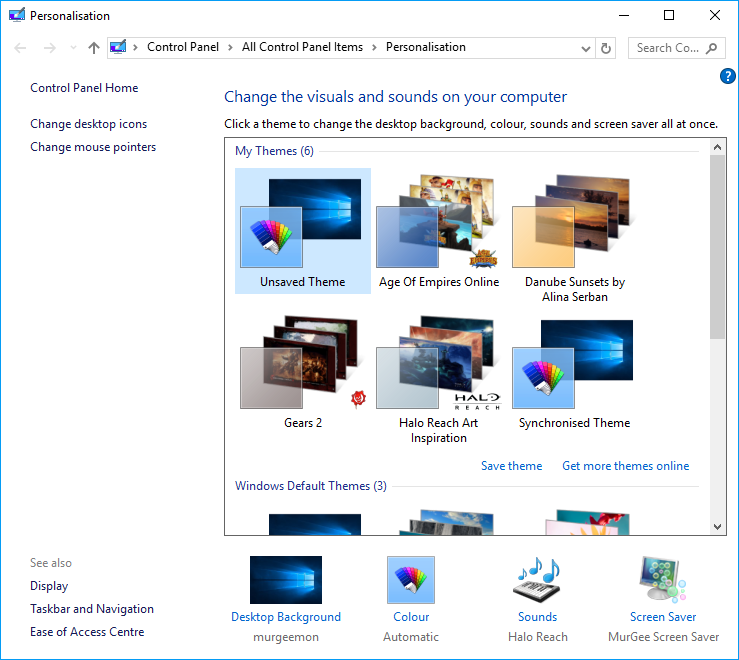 As displayed in the Screenshot above, you can change Current Theme of Windows by selecting any existing Windows Theme from Personalisation settings of Control Panel. Note that Age Of Empires Online, Gears 2, Halo-Reach Art Inspiration and other themes are available for selection. Yes you can even customize Font, Font Style, Font Size and other parameters of Windows Applications from Advanced Display Settings. Apart from configuring the appearance of the Software, you can even configure the Notification Tray Icon to easily identify and control the Auto Clicker. First Icon is the standard Icon which is displayed when the Mouse Clicking Software is not doing any Automated Mouse Clicking and other configurable Icon is displayed when Mouse Automation is used to send Automated Mouse Clicks to Active Application. Each Icon is basically a .ico file and there are lots of online websites which allow you to download the icon files for free. For easy identification, you can download Icon of the Game you are playing and assign it with the Configure System Tray Icon Screen so that you can remember the Automated Mouse Clicking Settings easily. You can simply Move Mouse Cursor to appropriate Icon in Notification Area to view settings of that particular instance as displayed in the screenshot above. Note that Instance Number, Location of Automated Mouse Clicking and Configured Keyboard Shortcut is displayed in the popup. You can simply Drag any Notification Icon in the Taskbar and move it to a different location. Yes various properties of Taskbar are also configurable from the Taskbar Settings as displayed in the screenshot below. 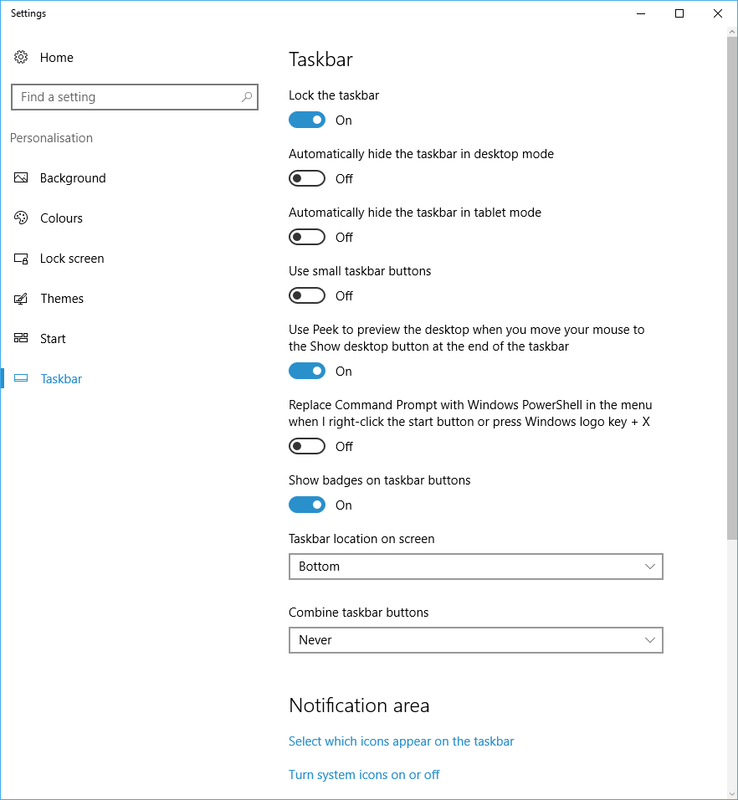 In order to get started Customizing notification icons, right click on the Date / Time in the Taskbar and click on Customise notification icons as displayed in the screenshot above. Once you done that a new screen will appear which will allows you to configure and control the notification icons. Note that you can Lock or Unlock the Taskbar, Combine Taskbar buttons and fully control what notification icons you want to see. 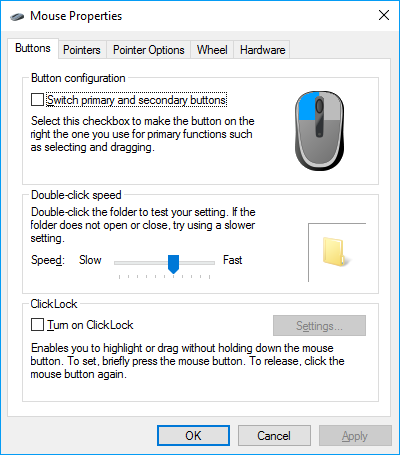 Once you can see the Notification icon of this Mouse Clicking Application, you can right click on it to configure and control the associated Auto Clicker as displayed in the screenshot below. You can alternatively double click on the Notification Icon to bring the associated Auto Clicker to front. When you are done configuring the settings of the Software, you can click on the Hide to System Tray button to hide the Main Application Window, hide Taskbar Icon and display a Notification Icon depending on the Taskbar settings. Another way to distinguish whether Automated Mouse Clicking is being performed or not is by looking at the Cursor. By default when Mouse Clicking is being done, the Mouse Cursor changes to Red Color Cursor. The Application Icon also changes to a different icon which is configurable as outlined earlier in this post. In order to change the Clicking Cursor, Click on the Top Left Corner of the Software and Click on Change Clicking Cursor as displayed in the Screenshot below. Once you Click on the Menu item as displayed in the screenshot below, you can select any .cur file which is a Cursor File and use it to visually identify whether Automated Mouse Clicking is in effect or not. You can even have audible indication of Automated Mouse Clicking by enabling Mouse Clicking Sound. In order to enable Mouse Clicking Sound, you need to select a .wav file which would be played for every Automated Mouse Click performed by the software. Make sure to select a short duration .wav file so that, you can hear the Mouse Clicking Sound clearly. Windows does provides lots of .wav files in C:\Windows\Media folder as displayed in the screenshot below. Auto Clicking on Online Games can be different as compared to Clicking on Desktop Games and hence the Software Installer installs two desktop shortcuts, one for Online Games and another for Desktop Games. The only functional difference between them is the Access with which the Desktop Shortcuts launch this Mouse Automation Software. The Auto Clicker for Games Shortcut launches the Application with Administrative Rights and other Shortcut launches the Application under signed on user credentials. When you want to Auto Click at one or multiple Fixed Screen Locations in a Game, you can use the inbuilt Fixed Screen Location Clicker as displayed in the Screenshot below. It allows you to define at maximum 6 screen locations at which you can click with 6 different keyboard shortcuts. Pressing the corresponding Keyboard Shortcut would click 1 time at pre-determined Screen Location. 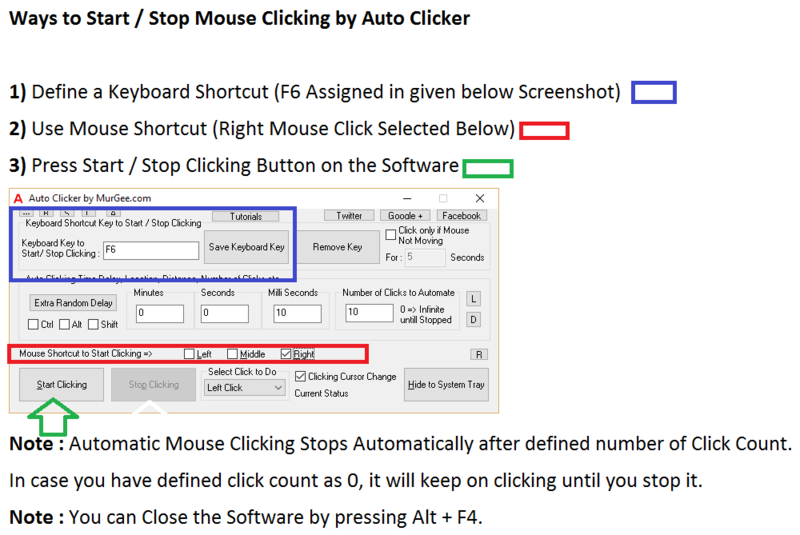 Note that the number of Left Clicks automated with this Mouse Clicker is also displayed with every Mouse Click Configuration. Another useful way of Automated Mouse Clicking is by matching Screen Color. Now you can let the Software do the Pixel Color Matching and Clicking with Color Clicker as displayed in the Screenshot below. This can be really useful in a Game in which the object to be clicked moves rapidly. All you need to do is define a Keyboard Shortcut and place Mouse near to the sprite or any other Moving Object in a Game. Upon pressing the Keyboard Shortcut, the Color Clicker will automatically match the Color stored in the Software and will Automatically Click it. Note that the area around Mouse Cursor is configurable and effectively, the smaller the search area, the faster Color Matching can be performed. 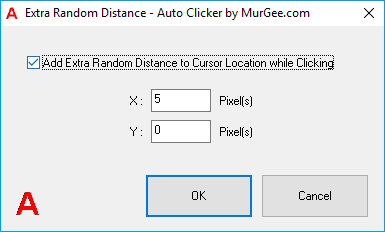 When you have a Complex Game in which you need to Click at Multiple Screen Locations, you can either use Multiple Instances of Auto Clicker as mentioned earlier or use the new Tool available as displayed in the Screenshot below. 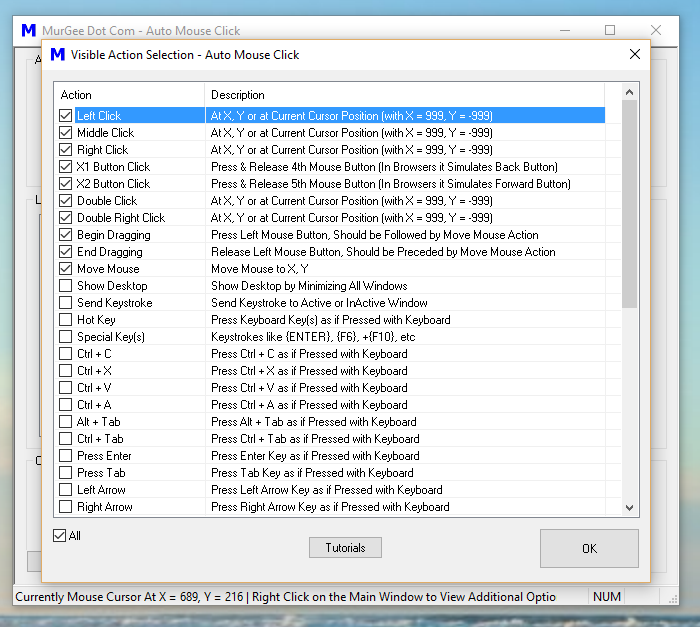 The given below Screenshot displays 4 different Mouse Clickers added in a single window with different Keyboard Shortcuts. 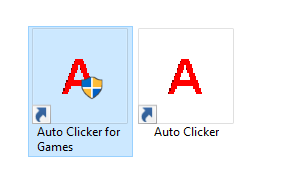 Yes you can even assign one single Keyboard Shortcut to start all 4 Mouse Clicker simultaneously. Configurable Speed of Clicking, availability of Key Presser and easy configuration allows you to focus on your Game and let this unique Advanced Mouse Clicking Software do the clicking for you. 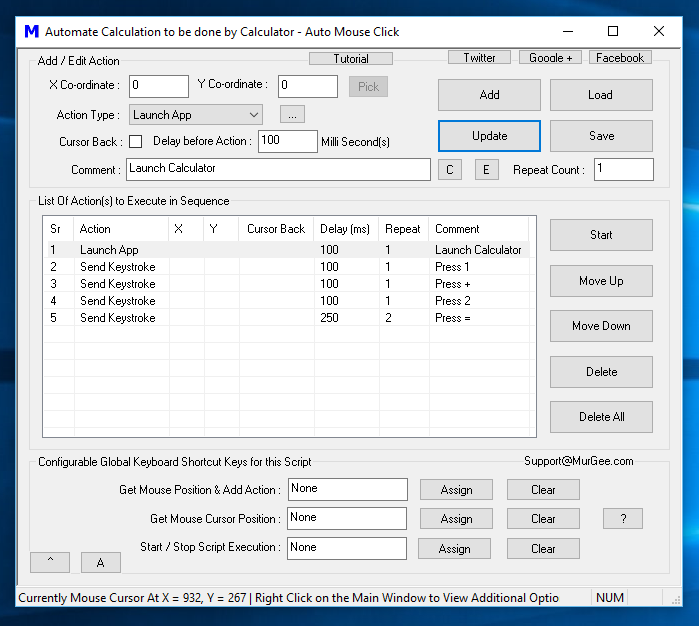 When you need more control of Multiple Auto Clickers, you can use the inbuilt Advanced Auto Clicker to add as many Mouse Clickers in a single Application. 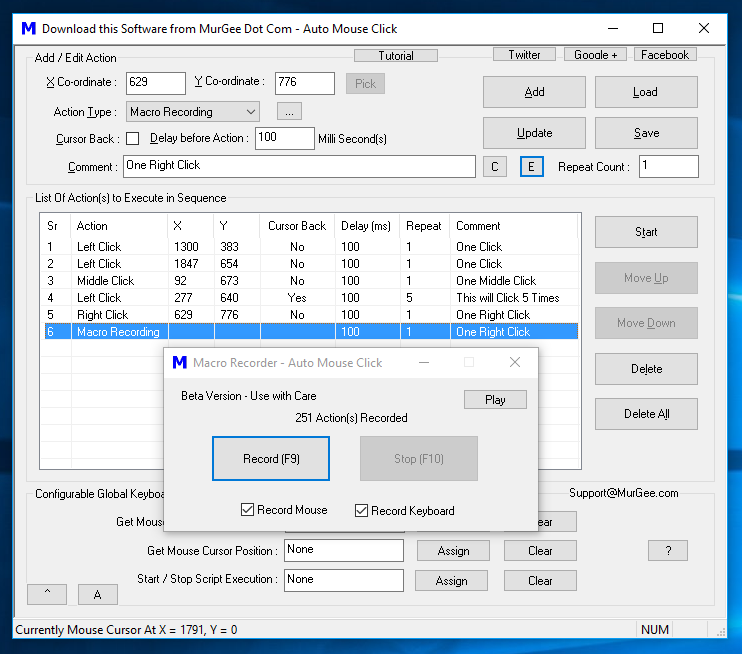 Each Gaming Profile containing single or multiple Mouse Clickers can be stored in a different File so that depending on the Game you are playing, you can load the appropriate Gaming Profile in this Advanced Auto Clicker. 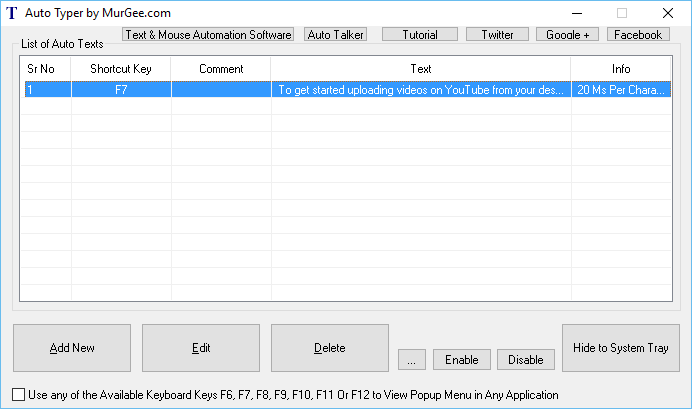 As displayed in the Screenshot below, you can Automate Left Click, Middle Click, Right Click, Double Left Click and other Mouse Click Types in the Software. 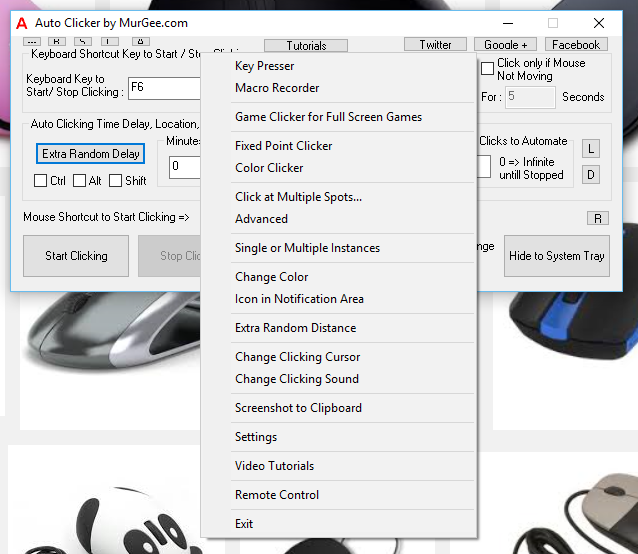 All the Mouse Clickers added to the software, run with their own Timers so you can start / stop any of the Mouse Clicker with associated Keyboard Shortcut. Online Games run in browsers and hence running this Mouse Clicking Application under signed on user credentials is sufficient. However Games which are installed on your Windows Computer generally require Admin Access to be launched and hence you need to use different way to control and Automate Desktop Games with Automated Mouse Clicking. Various Full Screen Games use Direct X or Open GL to provide rich Graphical User Interface, however thy use different mechanism to read and interpret user input in the form of Mouse Clicking and key Pressing. When playing a Full Screen Game in which the Auto Clicker fails to Click, you can use the Game Clicker to Simulate Mouse Clicking. 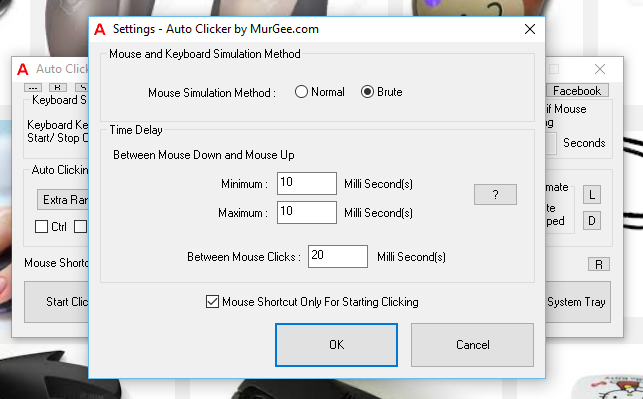 This Game Clicker has a single Mouse Shortcut to Start / Stop Automated Left Mouse Clicking as displayed in the Screenshot above. Note that Number of Automated Mouse Clicks to perform and time duration between Automated Mouse Clicking is configurable. Whenever you wish to disable the Right Mouse Click Shortcut to Start Left Mouse Clicking, you can simply close the Game Clicker and no more automated Left Mouse Clicks will be performed by the Game Clicker. You can Launch Game Clicker from Right Click menu of the Auto Clicker as displayed in the Screenshot above. Using Game Clicker for the first time requires extra installation and is fully guided along with Video Tutorials. Once you have followed the steps to Download & Install the files required for Game Clicker, you do not need to perform the steps again and again. When you launch Game Clicker for the first time, the Game Clicker Installer will appear and guide you to the complete procedure as displayed in the screenshot below. One thing here to note is that on Windows 10, the Game Clicker Installer displays the Operating System name as Windows 8.1 and otherwise there are no installation issue in installing Game Clicker on Windows 10. Upon successful installation of the Game Clicker, you can verify the installation by looking at the Device Manager of Windows Control Panel as displayed in the Screenshot below. 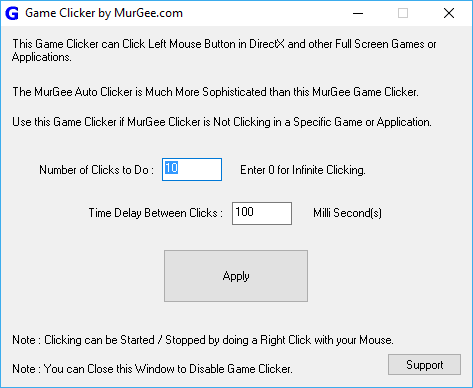 The Mouse Clicks sent by Game Clicker are sent on lower level as compared to the Main Application and hence you would need to have Administrative Access to your Windows Computer in order to install and use the Game Clicker. Once you have successfully installed the required files for Game Clicker, you can use the Game Clicker to Auto Click in any Desktop Application, Browser Game, Desktop Game or even on Full Screen Game running on Direct X, Open GL or any other technology. When Auto Clicker is not Clicking, this Game Clicker can become really handy to ensure that you can still Auto Click with Game Clicker. Yes there are enough Video Tutorials available for learning how to use each and every feature of this unique and best Mouse Clicking Application. Within minutes, you can learn how to Click Faster than every before, without straining your fingers. 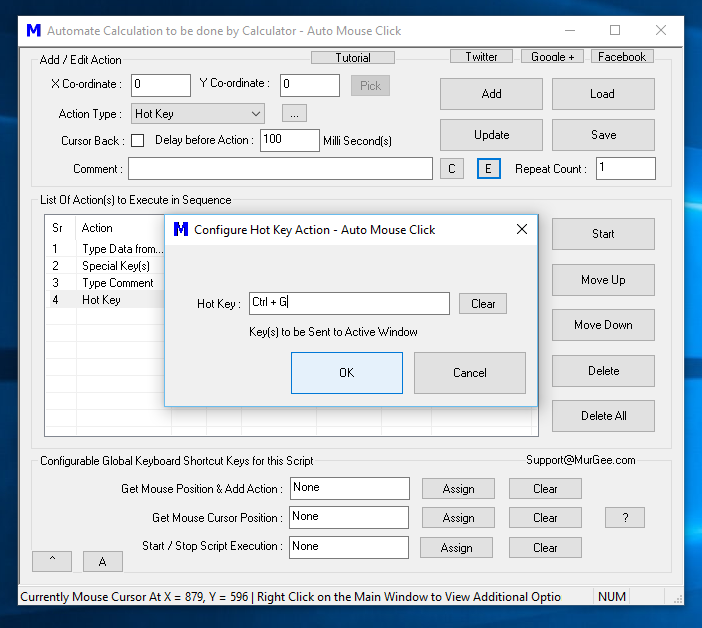 Yes Auto Clicker does have lots of configurations and features in which you can control Mouse Automation and must be used whenever possible. 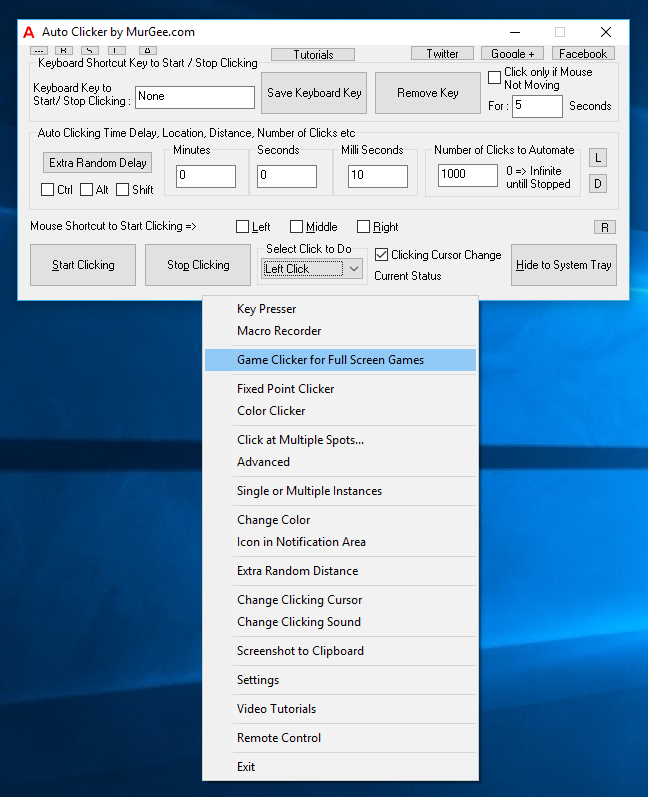 Configurable Location & Speed of Clicking, option of adding Random Time / Distance to Automated Mouse Clicking, Mouse & Keyboard Shortcuts to Start / Stop Automated Mouse Clicking, Audible / Visual alerts for Mouse Clicking and much more makes it the really Best Auto Clicker for Gamers to automate Repetitive Mouse Clicking in Games and other Applications. Download the Free trial of the Software, Install it and use it for Free and play only when you are completely satisfied by the features offered by this Mouse Automation Software. Now you can Keystrokes to Multiple Application Windows easily with a simple script. Each Window on Microsoft Windows is composed of multiple children Windows and the Windows Automation Software presented in this post can be used to send Keystrokes to any specific main or child window. All you need to do is select the appropriate window from the list of running windows and then select the Keystroke to be sent to that Window. In order to send Keystrokes to Multiple Windows, add multiple Action in the Script, configure multiple windows and keystrokes and you are done as displayed in the screenshot below. The screenshot displayed above displays a Script in which the Send Keystroke action has been added 4 times to the script and the whole script is configured to repeat 20 times. Note that a Keyboard Shortcut has been assigned as well to start Macro Script execution. With the Send Keystroke action, you can send ASCII, Numeric or special Keystrokes to any specific window or even to active window. The article Sending Keystrokes to Background Window talks in details about using this unique Windows Automation Software with which you can Automate a Browser Window, any Application Window or any other Application running on your Windows and simultaneously use your Computer for some other tasks. When sending Keystrokes is not sufficient to Automate your Workflow, you can use other User Input Automation methods to Automate any repetitive task. 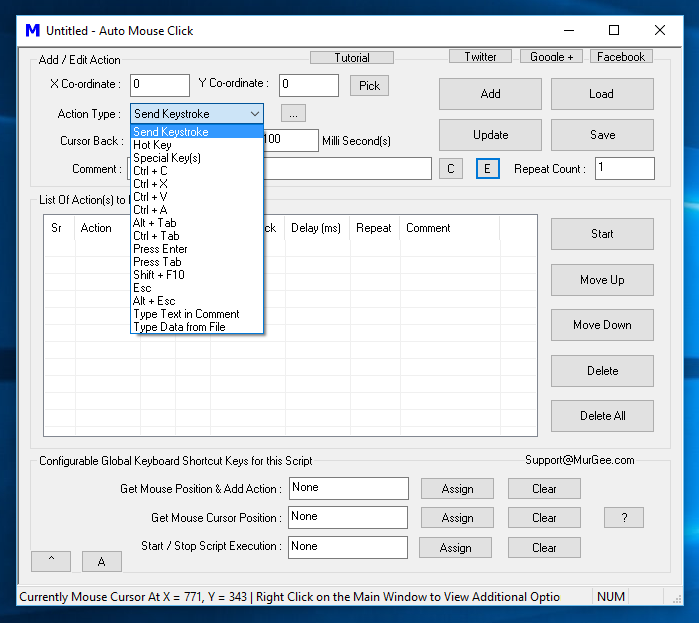 Whether you need to Automate a Game, Browser Window or anything else which requires repetitive Keyboard or Mouse Input, this Free to try and cheap Windows Automation Software titled Auto Mouse Click can be really handy. From creating simple bots to automate stress testing or anything for which you can create a macro script can be automated with this Windows Automation Tool. Lots of tasks on Windows can be done with Keyboard Shortcuts and hence there is a special action titled Hot Key to send Keystroke Combinations to Active Window. You can Automate Keystrokes like Alt + Tab to switch between multiple windows, Ctrl + Tab to navigate between multiple windows of same application or any other combination keystrokes or Keyboard Shortcuts with this Windows Automation Tool. Download the Free trial of the Application to Automate Multiple Windows and simultaneously use your Computer while this Automation Software performs repetitive tasks for you in background. Pressing Keyboard Keys Fast can be done with Software Utility or with continuous practice. Whether you want to press a single keyboard key really fast in a Game or you want to type text sentences faster, this post provides information on how you can type faster than ever before. 3 Keyboard Automation Software utilities are displayed in this post along with information on how to use you fingers to press single or multiple keyboard keys fast. The above Screenshot displays a Keyboard Automation Software which can press a Keyboard Key Fast for you. All you need to do is select the Keyboard key which you want to be pressed and released in short time span and also select a Keyboard Shortcut Key to instruct this Auto Keyboard Software Utility to start or stop pressing the selected Keyboard key. Yes you can even define how many times you want to press and release the selected keyboard key. 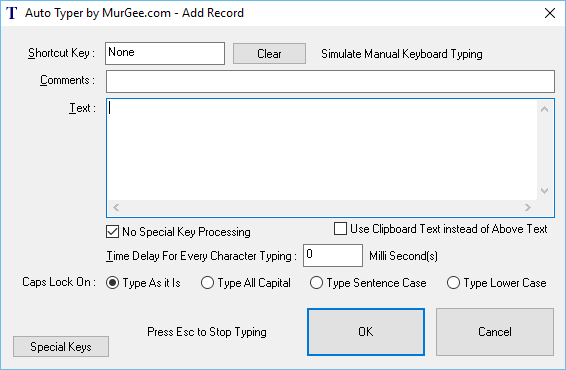 The Speed of pressing and releasing Keyboard Key is also configurable by configuring Time Delay between Keyboard Keys pressed by this Keyboard Automation Software for Windows. When you want to type fast in some Data Entry Application or some other Windows Application where you cannot do Copy – Paste, you can use the Text Typing Software Utility presented above to do Fast typing for you. Yes this Auto Typer Application actually types, as if a human is typing using Keyboard. The Typing speed of this Text Typing Software is configurable by specifying time delay between consecutive Keys pressed by this Software. You can Automate Fast Text Typing or even Slow Text Typing with this unique and easy to use Text Typing Software. Do have a look at the Text Typing configuration parameters configurable for every Keyboard Shortcut defined in this Text Typing Software. Instead of pre-defined text, you can instruct the software to type Clipboard Text and type in either Upper case, Lower case, Sentence case or even type as it is. You can even automate typing special keyboard keys like Tab, Enter, Arrow Keys, etc to fully automate Data Entry in Web Forms and in other Applications in which you can navigate between various controls with the help of Tab Key. When you want to press multiple Keyboard Keys in sequence, you can create a Macro Script and execute the Macro Script which will in turn press Keyboard Keys you have specified. The post Automate Keyboard Keys in sequence provides information about this Windows Automation Tool which can press Keyboard Keys from a Macro Script. Yes it can even type text sentence, press combination keys like Ctrl + A, Alt + Tab, etc. In case you want to Automate a Data Entry Software and you do have the Text to be typed onto the Data Entry Application, you can use this Auto Mouse Click Application to Automate the whole Data entry process and save Human efforts and improve productivity. In case you would like to use only your hand to press Keyboard Keys fast, then only continuous practice can be of assistance. Learning Keyboard Layout can take a while and once you do remember position of every Keyboard Key on your Keyboard, do practice typing text sentence. Improving speed of Text Typing or pressing a single Keyboard Key requires you to remember every Keyboard Key Position along with the Text you want to type fast. This post provides quick and easy way to create a Bot for playing online or Desktop Games. With appropriate planning and understanding of this Bot making Software, you can bot any Game within seconds. The Bot created with this method is most effective when you have a static interface in a Game which requires repetitive Mouse or Keyboard Input. In order to bot a dynamic interface in which Screen changes colors or characters moves from one place to another, you would need to have a deeper understanding of this Windows Automation Software to effectively bot such Game and use it with positive results. Creating this bot is all about planning a sequence of repetitive events. Think of this Bot Making Software as a combination of Auto Clicker, Auto Key Presser, Auto Typer and a Macro Editor all combined in one single software application. Apart from Automating User input in the form of automated Mouse Clicking, Automated Keystroke pressing, etc, this Software application allows you to launch Applications, Move Application Windows around the Screen, sound audible alerts using an audio file or use Text to Speech conversion and much more. Let’s create a simple Bot to Automate Mouse Clicking at 3 different Screen Locations and then later we will automate this whole process to repeat itself 50 times. Once you understand and can above displayed Macro Script, you are ready to create a Bot for any Online or Desktop Game with Auto Mouse Click Utility. Carefully view the above screenshot in which a Macro Script is displayed with 3 Mouse Clicks at different screen locations identified by X and Y Screen Co-Ordinates. Also note in the above Macro Script that the Repeat Count of the Macro Script has been assigned as 50. Finally note the Keyboard Shortcut to Start execution of Macro Script at the bottom of the Software. When creating a Bot for a Desktop Game, make sure that you launch this Windows Automation Tool with Admin Access so that automated Mouse Clicking, Key Pressing and other actions can reach the Game running as a Desktop Application. Most of the Desktop Games run with Admin Privileges and hence to run a Bot to Automate a downloaded Multiplayer or Single Player Game, your Bot must have Admin privileges as well. Online Games are run in browser Windows which are basically Windows Application and are run under signed on user account and hence you can either run the Bot with Admin or without Admin Access, both will work fine. Bots created with this Software Application are Macro Scripts and within few minutes you can create a Macro Script to Bot another Game, provided you do understand the repetitive human input required in any Game. 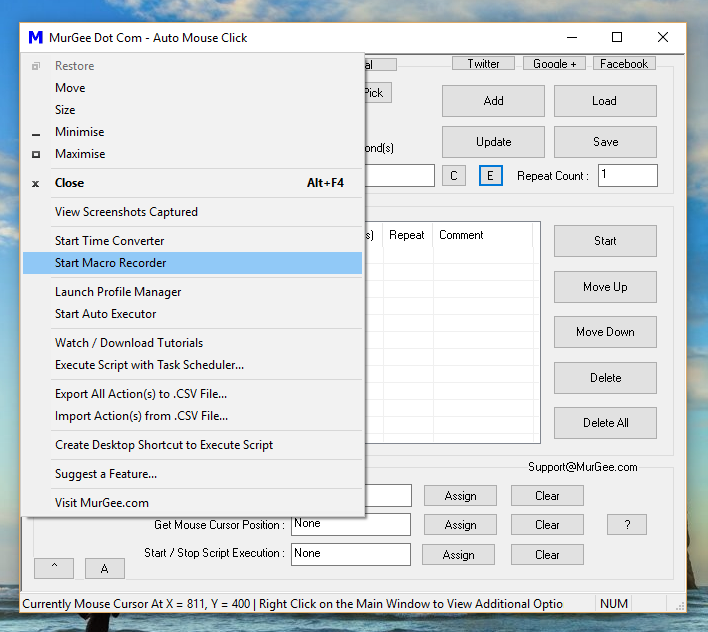 You can alternatively record and playback a Macro with Macro Recorder to Automate Mouse and Keyboard Input to your Windows Computer. Note that if the Bot you have created uses Mouse Clicking at fixed Screen Locations, then you must run your Game Bot at exactly the same Display Resolution. Generally speaking, there is no Resolution related dependency for Automated Keystrokes, however make sure that the Game you want to Bot is in exactly same screen / stage from where you want to start Botting the Game from your Game Bot. Now you can Automate a complex sequence of Keystrokes with simple Windows Automation Tools without wring a Macro Script or Learning Programming. All you need to Automate a Sequence of Keystrokes is to plan the Automation so that you can Automate the Keystrokes at your desired speed and desired number of times. You also need to plans whether you want the Keystrokes should be sent to Active Application Window or to a specific Window. When you are done planning, let’s get started and Automate any number of Keystrokes. This Keystroke Automation uses a Cheap Windows Automation Tool which has been designed for repetitive tasks. 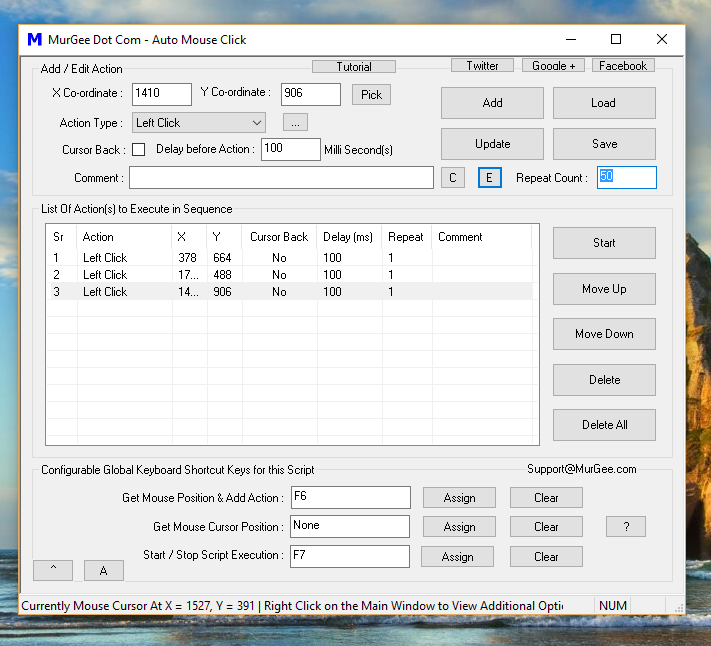 This Auto Mouse Click Application is being used for Automated Data Entry, Functional Testing, Stress Testing and in Online & Desktop Games to assist in Gameplay. As displayed in the Screenshot above, you have variety of options to send Keystrokes. A Sequence of Keystrokes is called as a Macro Script which can be constructed by adding multiple Key press Actions to the Script. In simple words, typing a text sentence is a sequence of pressing and releasing Keyboard Keys. Apart from pressing and releasing of individual keystrokes, combination of multiple Keyboard Keys is also used on Windows. Ctrl + C, Shift + F10, Alt + Tab, etc are examples of Keystroke combination used to accomplish various pre-defined tasks on Windows. The above Screenshot displays the Send Keystroke Action which allows you to Automate pressing and releasing of single Keyboard Key. This Macro Script Action allows you to send Keystroke to Active Window or to a specific Window. When you need to Automate a sequence of Keystrokes, all you need to do is add multiple Send Keystroke Action to the Macro Script and execute the Script with desired time delay. The given below screenshot displays a Macro Script to Automate a Windows Application by sending it Automated Keystrokes. Note that first Action in the above Script launches a Windows Application and then s sequences of Keystrokes Automates that Applications. Similarly you can Add any number of ASCII or Numeric Keystrokes to be Automated in sequence. Yes you can specify Repeat Count of individual Keystrokes and for the whole Macro Script as well. In case you simply want a specific Keystroke to be sent to a Game or to any Windows Application, you can use Auto Key Presser for Games which has got much simpler interface and does not requires you to create a Macro Script. Pressing a single Keystroke multiple times is much simpler as compared to creating a Macro Script, Planning the Keystrokes and finally Automating a Sequence of different Keystrokes. Apart from Time Delay interval specified in the Macro Script, there is another time delay interval which is part of Automating individual keystrokes. The Time Delay interval between pressing and releasing of a Keystroke is also configurable from the settings. This configurable time delay from settings is applicable to all keystrokes Automated with the Macro Script and for accurate Keystroke Automation, you must make a note of it and optionally change it as per your requirements. When you need to Automate Combination Keystrokes like Ctrl + G, Alt + T or any other Keystrokes which work in combination, you can add a Hot Key Action to the Macro Script as displayed in the Screenshot above. These combination Keystrokes are used by various applications and by Windows itself to automate specific Application specific tasks like Ctrl + P to issue Print command, Windows key + P Key to view Screen Projection options, etc. Few commonly used Keystroke combinations are accessible from the Action Type dropdown itself like Ctrl + C, Ctrl + V, Ctrl + X, Shift + F10, Alt + Esc, etc. This easy to sue and cheap Windows Automation Tool is capable of automating Text Typing, Clicking Mouse, Launching Applications, and much more as displayed in the screenshot above. 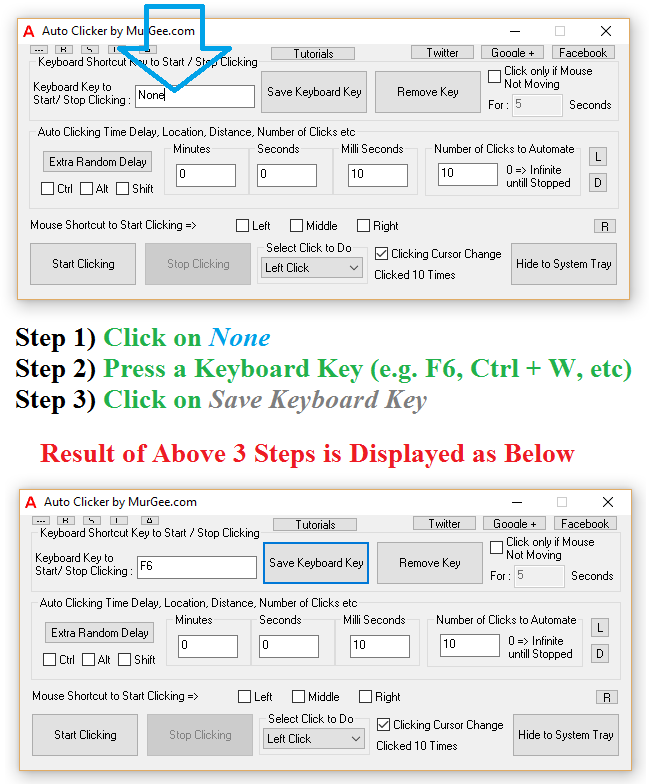 You can download Free Trial of this Auto Mouse Click Application and Automate any number of Keystrokes in Sequence to automate any specific Windows Application or automate a complex task involving multiple applications. There is no limit in the number of Keystrokes which can be automated by this Automation Tool, however when your script becomes too big to manage, do consider breaking a big Macro Script into several smaller Macro Scripts or alternatively use Mouse and Keyboard Recorder from within this Windows Automation Tool. Clicking Fast in Games is now easy and fun to do with the Auto Clicker Application presented in this post. Speed of Mouse Clicking is controllable so that you can program the software to do Automated Mouse Clicking at required speed. When doing Fast Clicking, if you feel that the Mouse is Clicking too fast, you can reduce the speed of Mouse Clicking easily. The Software presented here works on Windows 10, Windows 8.1, Windows 8 and on Windows 7 on both 32 bit and 64 bit versions of Microsoft without any issues. The Automated Mouse Clicking is as good as Human Mouse Clicking (pressing and releasing Mouse Button) with a physical Mouse. In order to Click faster, lots of Gamers use Jitter Mouse Clicking or other such methods which are good for demonstration purpose, however having a simple Keyboard Shortcut to Start or Stop Fast Mouse Clicking is what Gamers across the world are using. 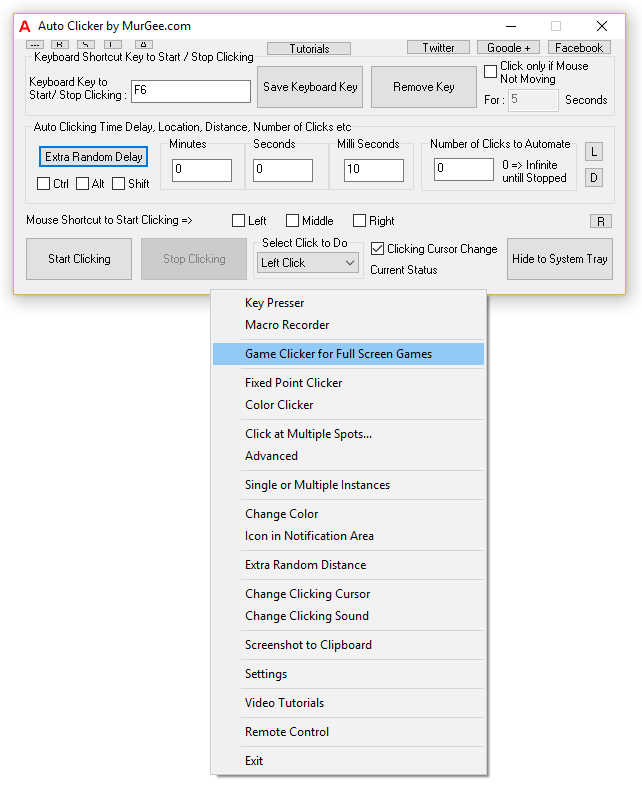 Using Auto Clicker as Fast Mouse Clicker or even Slow Mouse Clicker is easy and configurable. 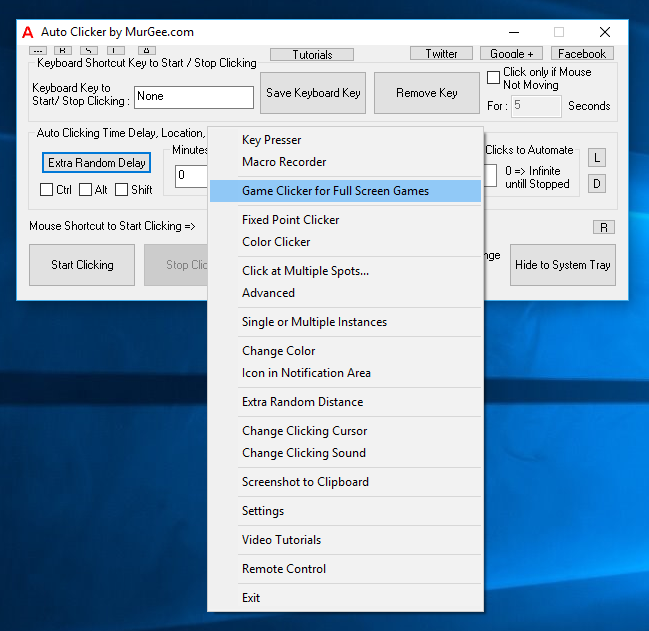 You can have Single Mouse Clicker or Multiple Mouse Clickers working at different speed for doing Fast or Slow Mouse Clicking at single or multiple Screen Locations. With Controllable Mouse Clicking Speed, playing Games can be really easy and fun. 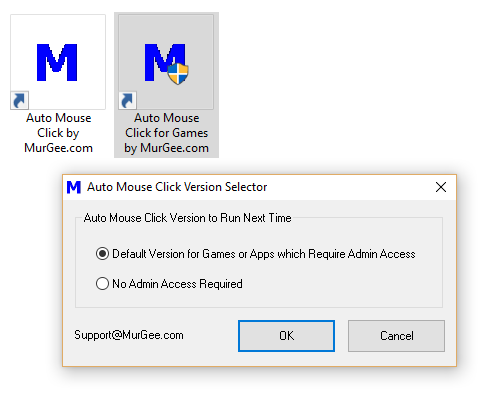 In order to Start Fast Clicking in Game or any other Application of your choice, all you need to do is Start the Mouse Clicking of the Software. There are multiple ways in which you can Start or Stop Automated Mouse Clicking, even when your Mouse is Clicking too fast. Keyboard Shortcut, Mouse Shortcut or Automatic Stopping of Fast Mouse Clicking is supported by this Software Application. 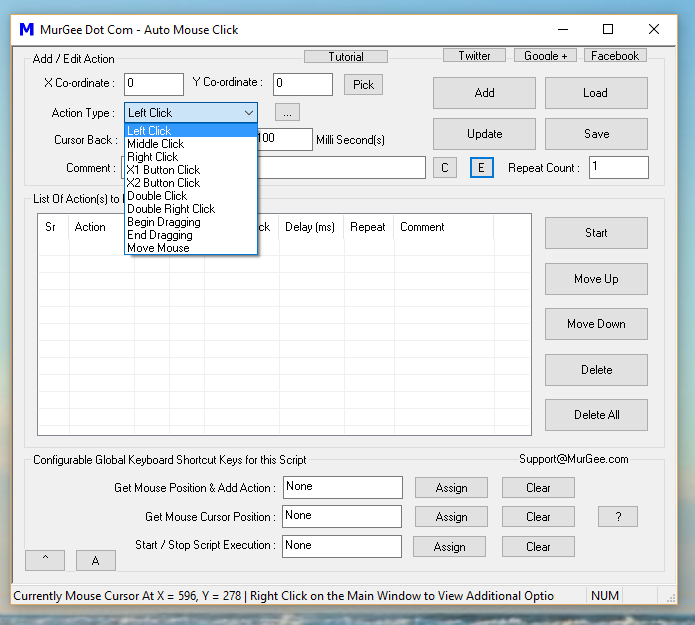 When Clicking Fast at Current Mouse Cursor Location is insufficient and you need to explore more ways, you can use Advanced features of this Mouse Clicking Application as displayed in the screenshot above. The Context Menu displayed in the above Screenshot has appeared by doing a physical Right Click on the Software Screen. Yes there are tons of features in which you can use Automated Mouse Clicking at Fixed Screen Location, Random Screen Location or even at Multiple Screen Locations simultaneously. This Software can click at any speed configured and can be configured to Click Faster, Ultra Faster or even at a slow speed depending on the configuration settings selected by you. 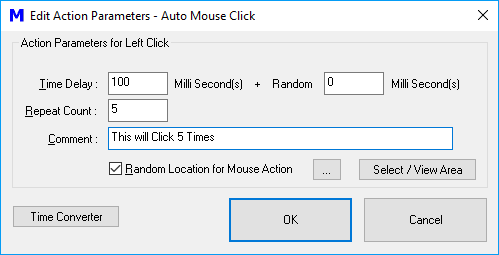 In the Screenshot below, a Fast Mouse Clicker has been created to do a Mouse Click every 10 Milli Seconds. Now every Mouse Click is effectively Mouse Down and then Mouse Up, yes there is some time delay between releasing of Mouse Button. You can even configure the time spent to release Mouse Button when doing Automated Mouse Clicking. Taking into consideration, 10 Milli Seconds time delay required to release Mouse Button (configurable from Settings), the above Auto Clicker with Click 100 times every 20 Milli Seconds. Effectively the above Screenshot displays a Fast Clicker which will Click 100 Times in 2 Seconds. 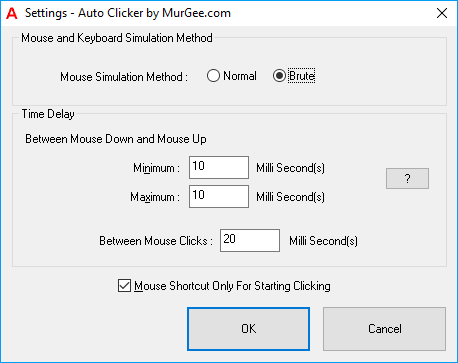 In order to simulate Human Mouse Clicking, you can add a Random Time delay in Automated Mouse Clicks and even in the time duration between releasing of Mouse Button as displayed in the screenshot below. 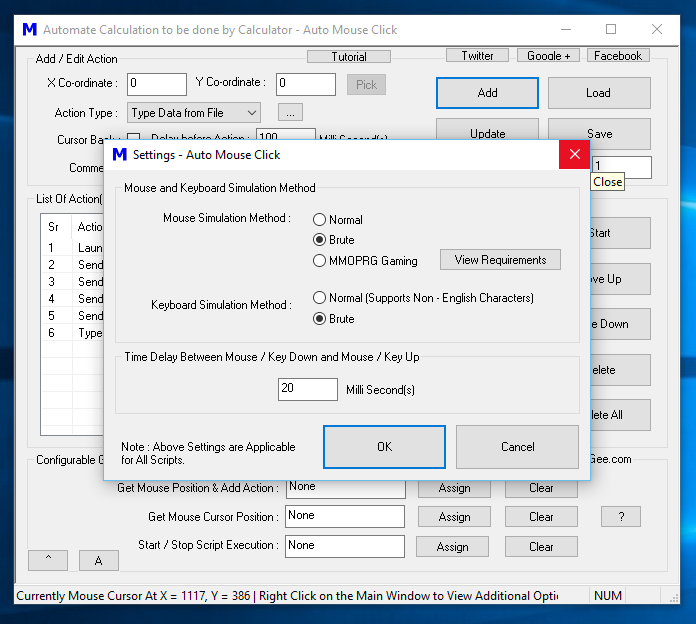 Yes a little bit of calculation is required to estimate How many Mouse Clicks will be done in 1 second with this configurable Milli Seconds method, however once you have used the Application to Click for a while, it is really easy to understand. 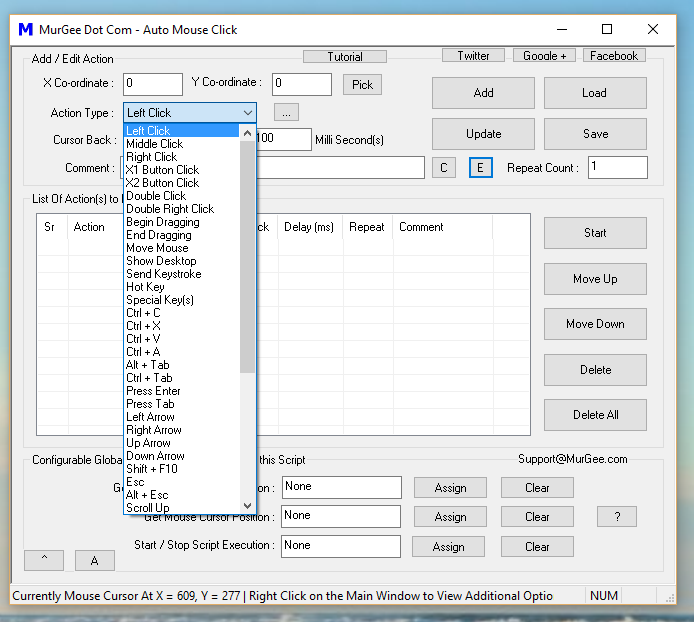 With default settings given below are few of the example settings which you can do to create your own Fast Mouse Clicker easily. Remember that the speed of Mouse Clicking is solely dependent on the total time duration you specify in the main screen + the extra time duration specified in the settings as displayed in the screenshot above. Time Delay of 10 Milli Seconds will allow you to Click 50 Times in 1 Second. Time Delay of 5 Milli Seconds will allow you to Click 100 Times in 1 Second. Time Delay of 1 Seconds will allow you to Click 1 Time in 1 Second. Time Delay of 30 Milli Seconds will allow you to Click 2 Times in 1 Second. Download the Free Trial of the Software and start using it to learn more about the features of the Software. The Free Trial of the Application is fully functional without any functionality limitation and hence you can use it for Clicking Faster in any Game or Application of your choice. Fast Mouse Clicking with fingers is now a thing of past. 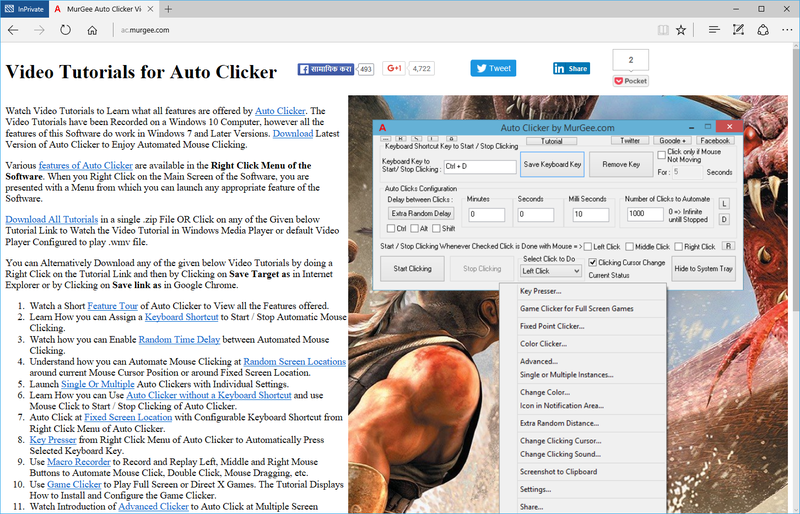 Go ahead and download the Auto Clicker to Click Faster than ever before. 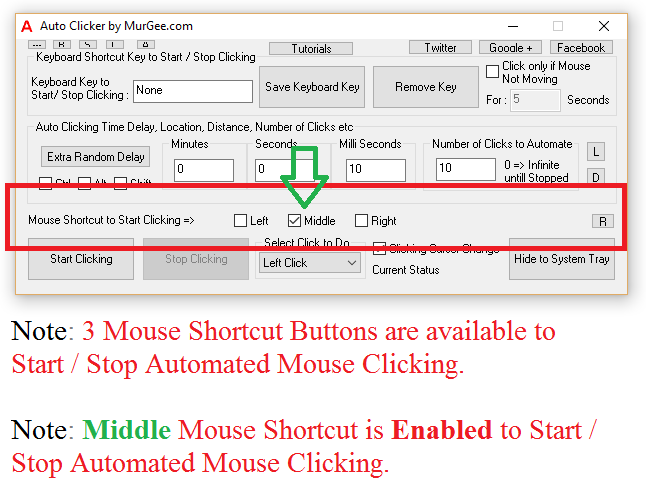 When using Auto Clicker, there are 3 ways in which you can start / stop Automatic Mouse Clicking. This post talks in detail about each method so that you can select the best method as per your convenience. Screenshots are provided below for easy understanding so that you can learn the method to start / stop mouse clicking even without reading this post. Use a Keyboard Shortcut to Start / Stop Mouse Clicking. This method to control Mouse Clicking is really easy to setup and use. Use a Mouse Shortcut to Start / Stop Mouse Clicking. When you physically press a Mouse Button, the Automatic Clicking can be started and stopped as configured. Press Start / Stop Button on the Software to Start and Stop Automatic Mouse Clicking. In case your Software is configured to Click at current Cursor Location, Moving the Mouse Cursor (while Automatic Mouse Clicking is enabled) on the Stop button would stop the automated Mouse Clicking. Apart from methods outlined above to Stop Automated Mouse Clicking, the Automated Mouse Clicking Stops Automatically when configured number of Mouse Clicks have been simulated. However if you have configured the Auto Clicker to keep on Clicking infinite number of times, you would need to stop the Mouse Clicking with any of the methods outlined here. As per default configuration, the cursor changes to a red cursor when Automated Mouse Clicking is being performed. Using a keyboard Shortcut is easy way to start / stop automatic Mouse Clicking. The given below screenshot provides the steps required to configure a Keyboard Shortcut to control Automated Mouse Clicking. The Software remembers the Keyboard Shortcut configured here so that you do not have to re-define the Keyboard Shortcut when you launch the Auto Clicker at a later date / time. As displayed in the above Screenshot, a keyboard Shortcut F6 has been configured to Start / Stop Mouse Clicking. When you have got a Keyboard Shortcut configured as displayed in the screenshot above, you can press the keyboard shortcut to Start Automatic Mouse Clicking. Note in the above Screenshot that number of Clicks have been configured as 10. Effectively when you press the Keyboard Shortcut to Start Clicking, the Software will Click 10 times and will stop automatically. Yes you can press the Keyboard Shortcut during Automated Mouse Clicking to Stop or Abort Automated Mouse Clicking. Using a Mouse Shortcut to Start or Stop Automatic Mouse Clicking allows you fast access to start / stop automatic Mouse Clicking. 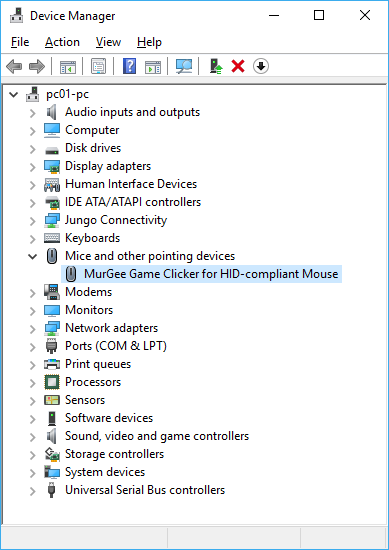 In the Screenshot below, a 3 button Mouse is connected to a Windows 10 Computer and hence you can see 3 Mouse Shortcuts available to Start / Stop Automated Mouse Clicking. In the above Screenshot, Middle Mouse Button has been configured to Start / Stop Automated Mouse Clicking. The Type of Mouse Clicks to Simulate has been selected as left Click. 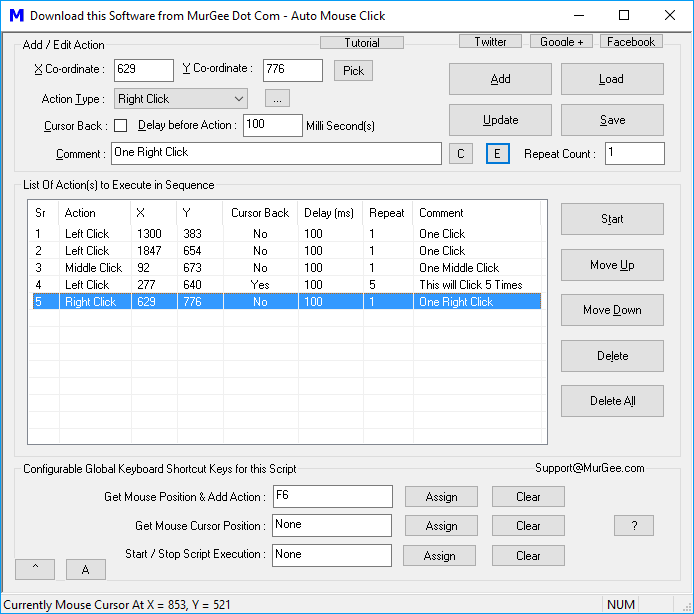 Effectively with above settings, whenever you press Middle Mouse Button, the Auto Clicker will simulate 10 Left Clicks and will stop Mouse Automation Automatically. In case you have a 5 button Mouse, you will be able to select any of the 5 Mouse Buttons to Start / Stop Automatic Mouse Clicking. The Start and Stop buttons in the Software allows you to Start / Stop Automatic Mouse Clicking done by this Mouse Automation Utility. Whenever Automated Mouse Clicking is stopped, the Start button gets enabled and whenever automated Mouse Clicking is being done, the Stop button gets enabled. The above Screenshot displays change in the state of Start / Stop Buttons on the Software. Note that during Automated Mouse Clicking, Icon of Auto Clicker changes and the number of Clicks done by the software is also displayed in the main screen of the software. Do explore other software settings to find out the best way to Automate Mouse Clicking as per your requirements. In order to find out what all features are offered by the software, carefully examine and read the text associated with every control. There are tutorials available for the software which outline the procedure to use each and every feature of the software. Lots of functionality is hidden in the Right Click Menu of the Software to provide simple interface of the software. When using Auto Clicker for Gaming purpose, you can utilize various advanced features to assist you in Gameplay. Yes Automated Mouse Clicking can be done in Online Games, Desktop Games, Multi Player Games, Browser based Games and you do get complete control of Automatic Mouse Clicking. Automate Mouse Actions like Mouse Movement, Mouse Clicks of various types like Left Click, Middle Click, Right Click, X1 Button Click and X2 Button Click with Mouse Automation Software. 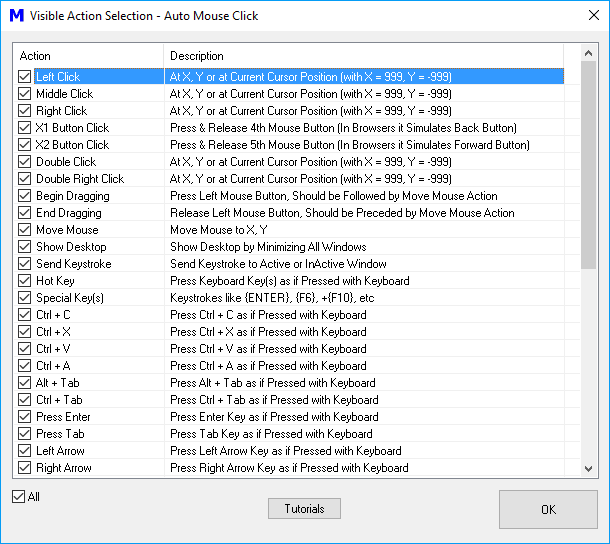 Yes you can even Scroll Mouse, Double Click and Drag Drop with this Windows Automation Software. Given below screenshot displays how you can enable or disable various Mouse Actions available for Automation. Just read on or visit Auto Mouse Click page to download the software. Various Screenshots are provided in this post to give you an idea of how you can Automate Mouse Actions easily without writing scripts or code. Simple Graphical User Interface makes sure that you can Automate any repetitive Mouse related Task on Windows within no time. Mouse Automation helps you automate a repetitive task and simultaneously provides you accuracy and speed of Automation. When making a Script to Automate Mouse Actions, you need to make sure that all Windows remain at the correct position. Screen Resolution is also an important consideration as Mouse Clicking is done by this Mouse Automation Software with the help of Screen Co-Ordinates as displayed in the screenshot below. 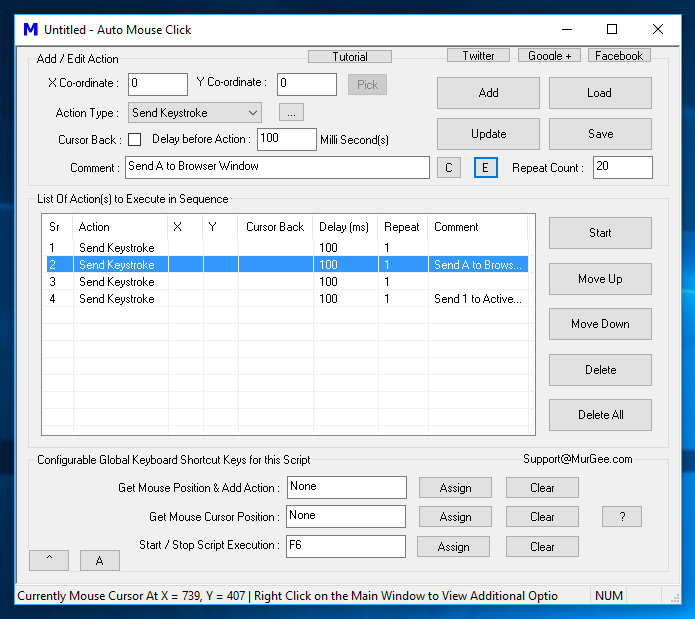 Group of Mouse Actions can be executed in sequence and yes you can even repeat any single Mouse Action or even repeat a group of Mouse Actions. Yes you can even repeat the whole Mouse Clicking Script with appropriate timing and speed control. You can even embed another Macro Script within a Macro Script to Automate large Amount of Mouse Clicks and other Actions. 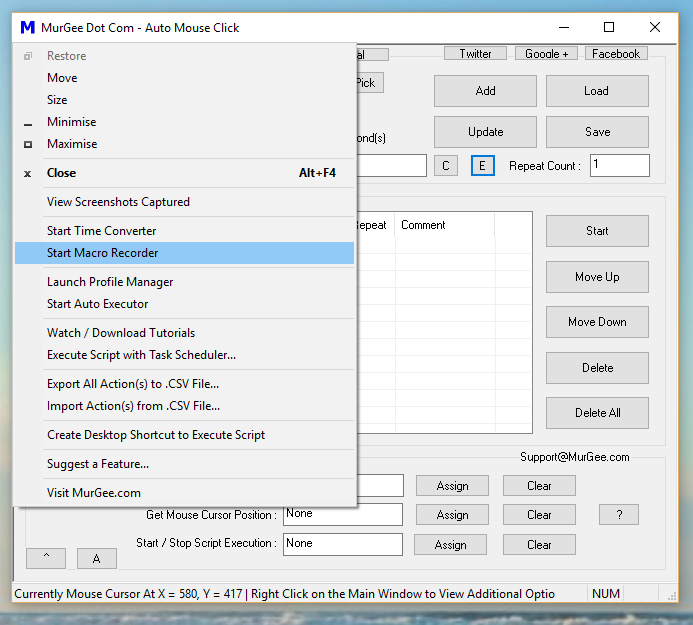 To Automate Large number of Mouse Actions, you can utilize the Macro Recorder, Record Mouse Actions and then play them back. Although Mouse Actions can Automate vast majority of Actions on Windows Computers, you can even Automate Keyboard Actions with this Automation Software. Pressing Keystrokes, Typing Text or Sending a keystroke to an Application Window are few of the Actions that can be Automated. Unlike Mouse Actions, Keyboard Actions are not dependent on Screen Resolution. When Automating Keystrokes, you need to take care of the Focus Window which is indicated by Blinking Mouse Cursor in Text Input Controls. As displayed in the Screenshot above, you can add Keystrokes and other Keyboard Actions to the Script and then execute the Macro Script to Automate your repetitive task. To get started, you can use Video Tutorials which outline step by step procedure to add Mouse or Keyboard Actions to the Macro Script and execute the Macro Script with Keyboard Shortcuts or from other Applications. 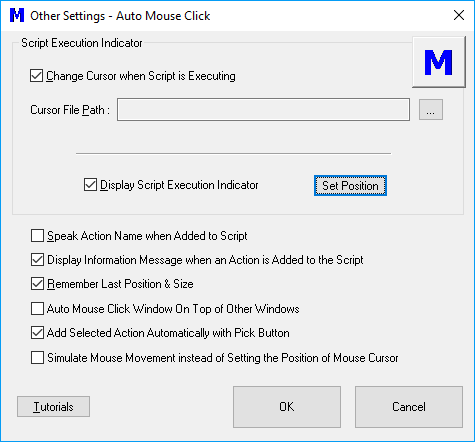 You can even make changes to the Script with the help of built in Macro Editor to Edit Mouse Actions, Keyboard Actions and other helpful Windows Automation Actions as displayed in the screenshot below. Mouse Automation is frequently used by Gamers to Automate repetitive Mouse Clicking in Online and Desktop Games. Mouse Actions along with Keyboard Actions can be used to Automate Excel, Automate Data Entry and other Business Applications to provide speed and accuracy to repetitive tasks which require too much Human Input. The Windows Automation Software presented above is a Free to download and try Software. 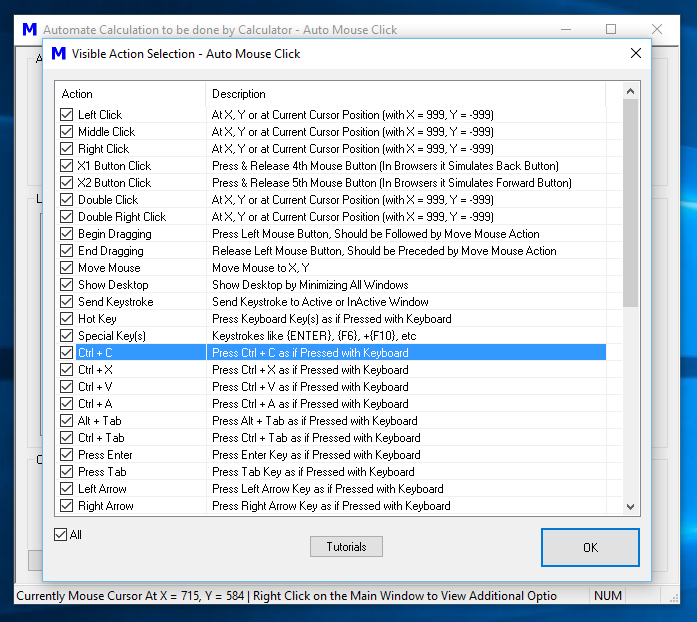 Automating Mouse Actions is really easy with this Mouse Automation Application. Once you are comfortable in creating a few Macro Scripts and executing them, you can move ahead, try the Keyboard Automation or even use other Advanced Automation Actions like sending a Keystroke to a particular Window, Minimizing or Maximizing Windows and other Actions with which you can Automate any simple or complex tedious task. With the help of 3G or 4G Modem, now you can send SMS Messages with Bulk SMS Software presented here. Sending SMS Message with a USB Modem with 3G or 4G Connectivity is now easy and quick to do. The SMS Software presented here is Free to Download and use and works on Windows 7, Windows 8 and on Windows 8.1 Computers as well apart from Windows 10. This Bulk SMS Software allows you to manage Mobile Numbers and allows you to control the number of SMS Messages that can be sent with the Bulk SMS Software. The above Screenshot of Bulk SMS Software Application provides quick and easy way to manage and configure all parameters of your SMS Marketing Campaign. As the SMS Messages are sent with a SIM Card, you need to yourself upload list of Mobile Numbers and pay the charges for sending SMS Messages with appropriate Mobile Network providers. In India there are multiple Mobile Service providers which allow you to send Bulk SMS Messages. The above Screenshot of Bulk SMS Software displays a Airtel 3G Modem connected to the Bulk SMS Software along with the number of SMS Messages sent by the software. Apart from Airtel in India, you can get a SIM Card from Vodafone, Reliance, Idea and other Mobile Service Operators. Configurable settings of this Bulk SMS Software allows you to configure and control allowed number of SMS Messages sent by any given 3G or 4G USB Modem. Now a days in India, almost every Mobile Service Provider is suggesting to upgrade from 2G SIM Cards to 4G SIM Cards and thereby providing faster Internet Connectivity and better Network Connection. Sending Mass SMS in India is regulated by Indian Government and consumers can opt out of Promotional SMS by subscribing to Do Not Disturb Registry. As this Bulk SMS Software sends the SMS Messages with the help of a SIM Card, you need to make sure that the SMS Messages you are trying to send are legal and you are allowed to send Bulk SMS.